Prime Minister Manmohan Singh tonight accomplished his domestic political mission at the end of his 85-minute reply to the eight-hour-long short-duration discussion on Indo-US nuclear deal — the CPM dropped its demand for a “sense of Parliament” resolution. * US President George Bush has assured him that Washington is not shifting goal posts. *	The autonomy of scientific decisions will be maintained and there will be no interference in strategic programmes. Rumours that the Election Commission has disqualified 37 MLAs, including the Punjab Chief Minister, for holding offices of profit, sparked hectic political activity today, with Capt Amarinder Singh cutting short his visit and rushing to Chandigarh. * Two years have passed since the Union Ministry of Civil Aviation decided to introduce a system of biometric screening at all the major metro airports. But despite the enormous security threat, the Airport Authority of India (AAI) is yet to decide on even the type of system it wants. Should India also have pulled out of the tri-series in Sri Lanka? The President, Dr APJ Abdul Kalam, today called upon the countrymen to work for making the country not only rich and prosperous but also safe by 2020. 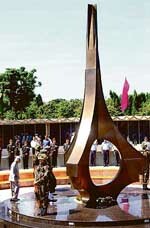 He also promised to initiate the process for raising a national war memorial in the national capital to commemorate the soldiers who made supreme sacrifices for the country since 1947. 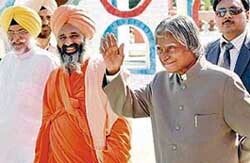 President Dr APJ Abdul Kalam urged that the worship places in the country should be used for reforming people. He was speaking at Nirmal Kuteya here today where he came on the invitation of Baba Balbir Singh Seechewal, the man behind cleansing of sacred rivulet Kali Bein. Our foreign policy is determined strongly by our national interest. We have not allowed any country howsoever powerful to influence our policy. Giving a twist to Prime Minister Manmohan Singh’s suggestion for institutionalised arrangements to bring people from both sides of Kashmir closer, Pakistan President Pervez Musharraf has said this could be the “starter” of a process for “joint management” of the disputed region. Shehnai maestro Bismillah Khan was hospitalised here today due to extreme weakness following a brief illness. Khan, 92, had fallen ill a week ago and was being treated by a private consultant at his residence here. Exemplary courage, by Bhai Isher Singh, a former CRPF cop and a Raagi from Hyderabad foiled the kidnapping of a young girl, daughter of a senior Army officer, in morning here today. Residents did not see such a kidnapping even during days of militancy.